As CalGeo rolls out its new member recruitment outreach to prospective member firms, our meetings have revealed several unique distinctions and advantages about CalGeo which set our association apart from others in California. We thought you may find these useful when you are sharing the benefits of being a member of CalGeo with others. First: CalGeo is the only association serving the unique needs of geotechnical engineers in California. Other groups out there represent engineering generally, but there are technical, business and practice scope issues that affect geotechnical engineers differently than others in the professional engineering world. To be most useful, these require uniquely tailored solutions and technical education. Although issues that affect geotechs also sometimes affect non-geotechs similarly, advancing the priorities of other engineering practice areas can sometimes denigrate the unique services and expertise that geotechs bring to engineering tasks. As an example, a bill in the legislature last year would have gutted the effect of the practice act that certifies our unique place and role in the engineering world. Protecting and guarding the unique role that geotechnical engineering provides to both the clients and the public safety, is of importance if your training and experience is to continue to be realized within the engineering world. CalGeo is run by geotechnical engineers and engineering geologists for the benefit of the geotechnical community. Second: CalGeo is "California centric" in its mission and priority. Members of CalGeo were instrumental in creating the original practice act that created the geotechnical engineering specialty in California. CalGeo has been involved ever since in helping to make sure subsequent regulations and laws preserve that unique niche for the services we provide. This means having an ongoing voice in both the regulatory forums and the crafting of legislation in California that affect what we do. With national groups that have 50 states and the federal government to keep an eye on their resources and efforts by nature have to be shared and diffused in that effort. 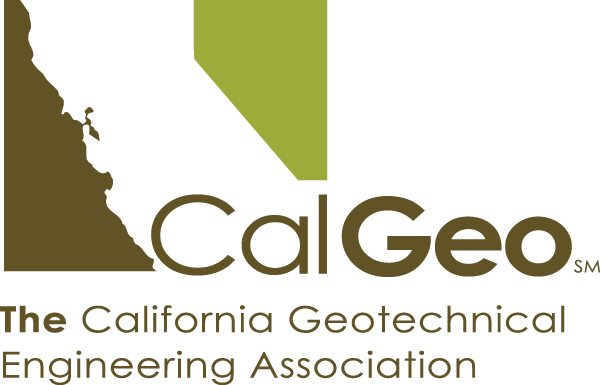 CalGeo is focused exclusively on California issues and concerns because most often it is California legislation and regulatory actions that directly affect and imperil the geotech's ability to practice and make a living. Sometimes we are in concert with and can work along side the efforts of these other groups, and sometimes, because of their broader representation, we must take different positions from those groups that specifically preserves the benefits or services of the geotechnical profession. There are other groups that focus on providing technical counsel and assistance to those in the geotechnical world, but they don't significantly engage in legislative or regulatory efforts in California. We are unique in that we focus on both technical training and advocacy roles. As someone shared during one of our conversations, "The laws and regulations are going to be made in California whether we like it or not. The question is are we going to be active in directing those conversations, or wait until they are already passed and are upon us, and then try to react." That timing is most often too late to affect a direction. Third: The nimble nature of CalGeo. Our smaller size and hands-on leadership allows CalGeo to move instantly when issues arise. When a new crisis becomes apparent, your board can move very quickly to take a position or weigh in on an issue that could significantly impact the parameters of your business and practice, sometimes within the matter of a few hours. This stands in stark contrast to other groups who have a cumbersome board or a national footprint they must move through before they can get engaged on an issue or concern. This ability to respond quickly means more impact. Fourth: In CalGeo, an individual voice matters. CalGeo is run by members to serve the needs of members. Any member can be as engaged as they want to participate in and affect the direction of the organization. CalGeo has a myriad of opportunities in order to accomplish that goal. Lastly: Networking opportunities and relationships that being a member can afford. Relationships are indispensable to success. Having in place collaborative systems to vet technical issues, practice concerns and business challenges are critical to sustainable business success in this quickly changing world. Education and peer associations are a critical value to solving problems in real time. When we are isolated, mistakes are too often discovered after the fact. When you avail yourself of these resources, each member can do better quality and more profitable work in their daily practices. They can get a better pulse on what issues are affecting your industry in real time. They can anticipate challenges as they begin to arise, requiring legislative, regulatory advocacy or intervention and find good competent people to join their firms when the need arises. These are just a few of the benefits people enjoy from being a member. Hopefully this helps to provide a starting point for your discussions when you share with others the benefits being a part CalGeo and a few of the tools that will be at their disposal. I am sure you can think of many others. We also hope this serves as a reminder to you to take full advantage of these resources yourself as a current member. We know that you are busy running your businesses day to day and that taking time to sharpen your tools seems unproductive when you have such a full plate at work. But time invested to make your work more productive and efficient is a key to being profitable. Take the time to enrich yourselves with the resources CalGeo provides and use them to their full capacity and you will find it well worth the effort.